In the early part of the century the Eagles were built on continuity. Donovan McNabb and Brian Westbrook. Andy Reid. Things were predictable. These days? Not so much. The team has had five different head coaches in the last decade. The team has also had five different primary quarterbacks. The team has played 160 games over those 10 years, and Zach Ertz at 91 has played the second-most regular-season games in that time among offensive players (Brent Celek has played 143). And yet despite that, the Eagles have three division titles, five playoff appearances, six winning records, and one Super Bowl title in the last 10 years. That level of discontinuity doesn’t normally lead to that level of success. Let’s take a look at the best Eagles fantasy seasons of the last decade. The Eagles have gotten at least 214.6 fantasy points out of the QB situation every year of the last 10. The only other teams who can say that — Atlanta, Green Bay, New England, New Orleans, and Pittsburgh — have basically had one quarterback in that span. The Eagles? Vick, McNabb, Carson Wentz, Nick Foles, and Sam Bradford have all been the team’s leading passer for at least one season in the last 10, and even Mark Sanchez started eight games in 2014. Vick’s 2010 is the clear leader, but the lack of stability here is the real story. Two years ago, in 2011, McCoy scored almost exactly this same fantasy total (he put up 330.4). In between those was a 2012 season where he didn’t even reach 200, and even if you look at it on a per-game basis he was 20% worse that year than either 2011 or 2013. In fact, McCoy’s career has been a practice in yo-yoing, as he went from 2011 to 2018 with only one year (2016-2017) with consecutive high fantasy finishes. Every third year of his career has been under 1,000 yards, while the others have been over. By that pattern, he’ll top 1,000 in 2019. Consider me skeptical. This season for Maclin is extra remarkable, as it came after he missed the entirety of 2013 to an ACL tear and came back like it was nothing. There really wasn’t even a grace period; Maclin scored in his first game, each of his first three, and four of his first five. Through eight games, he had eight touchdowns. For a player who had spent a year on the shelf, that’s remarkable production. 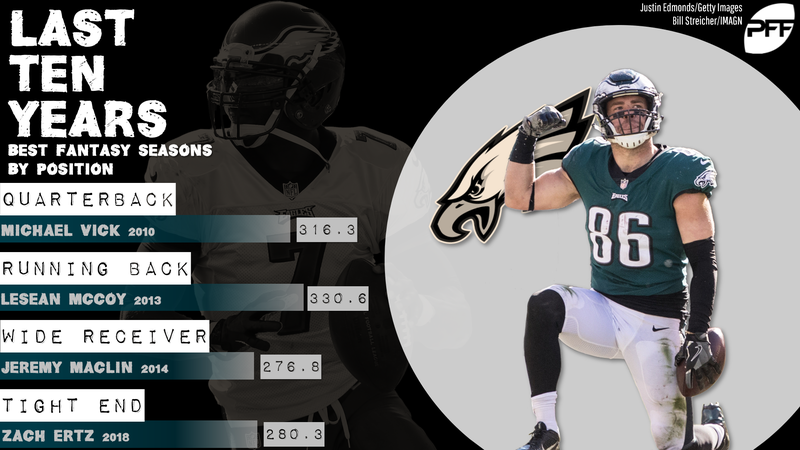 Ertz had one of the best tight end seasons of all time … and the Eagles still got 90-plus PPR points out of rookie Dallas Goedert last season. As a unit, only the 2011 Patriots got more fantasy points from tight ends than last year’s Eagles. Goedert’s season was the best in the last decade by an Eagles tight end not named Ertz or Celek.